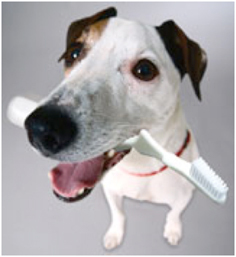 All owners are welcome to bring their pets in to the surgery for a free dental check-up. Those requiring and booking dentals during February will receive a 30% discount off the normal procedure price (excluding antibiotics and painkillers). Examples of fees are given below. Dental disease is a welfare issue. “Dog’s breath” is the very least of the worries. 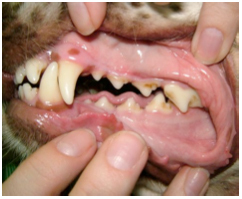 Oral pain is a significant feature – but often goes unnoticed because pets carry on eating. As periodontal disease progresses, bacteria spread from the mouth through the blood stream to affect other organs such as the kidneys and heart valves. In addition little showers of bacteria are carried into the lungs with every breath. Dental disease is rightly regarded as a whole body problem and one that needs more attention. 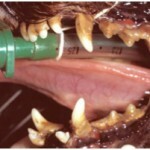 To highlight this very serious issue we are donating our time to examine pets’ mouths free of charge during February. CATS: A basic descale under general anaesthetic normally costs approximately £150, but more significant dental work such as extractions can cost up to £200 extra. These charges are before the 30% discount is applied. 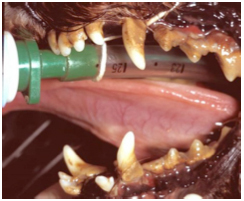 DOGS: A basic descale under general anaesthetic for a 30kg dog normally costs approximately £225, but more significant dental work such as extractions can cost up to £300 extra. These charges are before the 30% discount is applied. Sam, a wire haired dachshund, came to the clinic unable to urinate and struggling to pass motions. Clinical examination showed that Sam’s prostate was enlarged and this was confirmed by radiographs. Further tests showed him to also have a urinary tract infection. 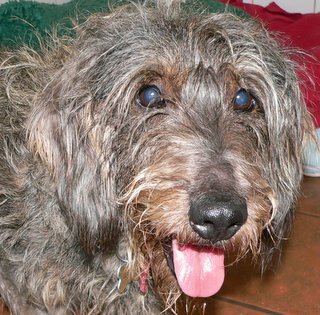 After a few days of antibiotics, hormones and regular urinary catheterisation Sam began to be able to pass urine and faeces by himself and made a great recovery. He will need regular monitoring to protect him against a relapse.